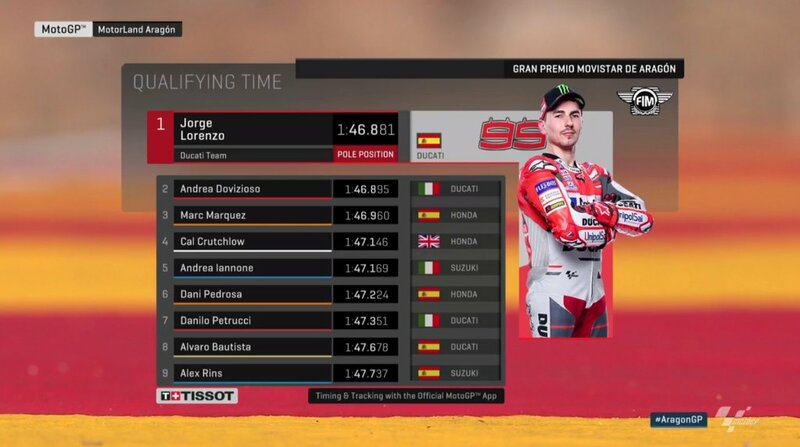 Aragon MotoGP 2018 Live Stream Final Race, Sunday, September 23, 2018, & Qualifying Race Results: Lorenzo Nails The Qualifying As Ducati Duo Will Start from The Front. MotoGP Action will be live from Aragon this weekend. And once again we will get to see the fight between defending champion Marc Marquez fighting against the Ducati Duo of Jorge Lorenzo & Andrea Dovizioso. Jorge Lorenzo on Saturday nailed the Qualifying as stole the pole position from his teammate Andrea Dovizioso in the last minute. Now Lorenzo & Dovi will start from the front. Sportsfiesta brings you Aragon MotoGP 2018 Live Stream Final Race. The live feed of Austrian MotoGP 2018 will be available on MotoGP.com, Tenplay, Sony Liv and BTsport. Aragon MotoGP 2018 Race Schedule for Sunday, September 23, 2018. MotoGP Fans in India will get to see the race at 17:30 hrs. Fans in Malaysia will get to see the race at 20:00 hrs. UK Fans will get to see the race at 13:00 hrs. It was sensational qualifying session on Saturday, the last 3 minutes of qualifying was edge of the seat stuff as Marquez produced a stunning lap which looked pretty good for qualifying until Dovi challenged him. Dovi not only took the fight to defending champion but also dethroned him from best lap. The real drama started after that Marquez who got stunned from the pace of Dovi made a mistake thrown him out of the contention of pole in meanwhile Jorge Lorenzo put in flying lap to grabbed the pole position from his teammate Andrea Dovizioso. It was his third consecutive pole.